Costa Coffee take us on an interactive tour of the journey from bean to cup. There is so much love that went into this One Pager I don’t know where to begin. The illustrations are beautiful and each chapter is packed with color, subtle animations and loads of interesting facts. Lovely touch with the chapter preloaders around the directional arrows and the wooden frame around the site on bigger monitors. Stellar job Graphite Digital! *update* Read our interview with creative lead Jon Gibson. 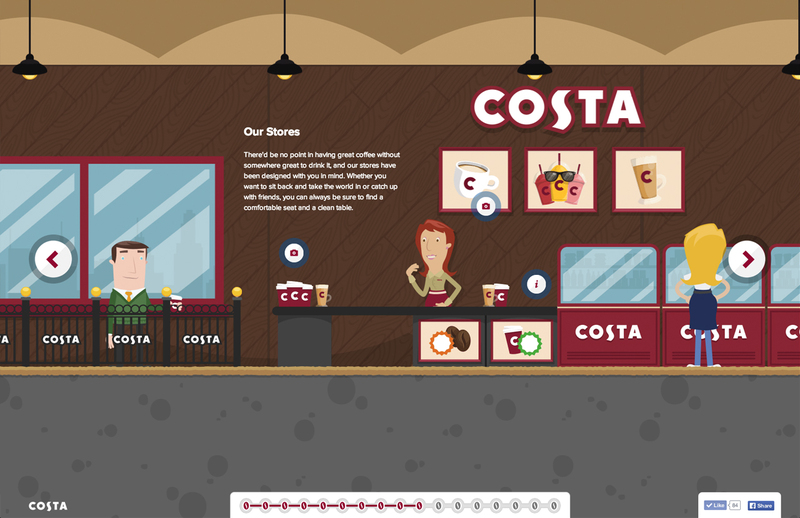 The Costa Experience is a visually rich, parallax website full of animated illustrations and interactive elements. It is responsively designed to accommodate varying devices and browser sizes. It's fully optimised for Chrome, however it gracefully degrades down to Internet Explorer 7. Site content is dynamically loaded to minimise processor activity & loading times. We wrote custom easing and math functions to animate our sprites and elements.